Still wondering just how exactly 4RootZ works? Do you want to see if it works for yourself before you go ahead and buy it? We understand that. 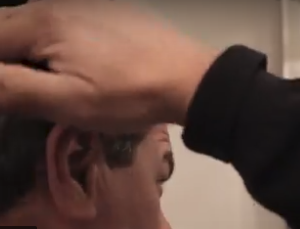 We created this video ourselves to show how easy it is to use 4RootZ to cover up those grays. Check it out below and see the process for yourself. Using 4RootZ is as easy as using your favorite hair gel to style your hair. Easy, right? We aren’t just making it look that way. It totally is. This actor is by no means a professional when it comes to hair dying or styling. Anyone who can use a hair gel can use a tinted hair gel. If you are interested in learning more about 4RootZ, get in touch with us or try it for yourself. Here is a written breakdown of the process. Styling your hair with colored hair gel is just like any other gel. It will give you a good amount of hold and provide you with rich color at the same time. Apply a little bit of 4RootZ to your fingertips – this one seems self-explanatory, but it is important to know the difference. Rather than squeezing out a sizeable amount of 4RootZ into your palm, squirt out just a little bit onto your fingertips. If you use too much, you will probably have to rinse your hair for it to come out and back to a lighter shade. Rub the gel through your hair – Run your fingertips through your hair, working the formula down to the root and getting it applied evenly. Give a little bit of attention all over your head or get just into the spots you need like the sideburns. Wash your hands – 4RootZ will not stain your skin or your hands. Simply wash your hands after use and you will be good to go. Shampoo to wash out – When you are ready to get 4RootZ out of your hair, use shampoo to remove. It comes out just like any other gel that you use on a daily basis. You can wash it right out and revert back to your natural hair color for relaxation time. Thank you for using 4RootZ!